Pineapple is a popular fruit that also has little-known health benefits. Find out more about its history, cultivation, and nutritional profile. Pineapple, a perennial herb named because of its resemblance to the pine cone, has been one of the most popular tropical fruits for centuries. Second only to bananas, the pineapple is now the most significant tropical fruit crop in existence, although many are now unaware of the fruit's nutritional and medicinal value. Keep reading to learn everything about the pineapple, from its history, characteristics, and medicinal value to healthy recipes and buying and growing options. Easing digestion. Pineapple can help in the treatment of gastrointestinal problems, such as slow digestion, constipation, and Irritable Bowel Syndrome (IBS). Relieving joint pain. 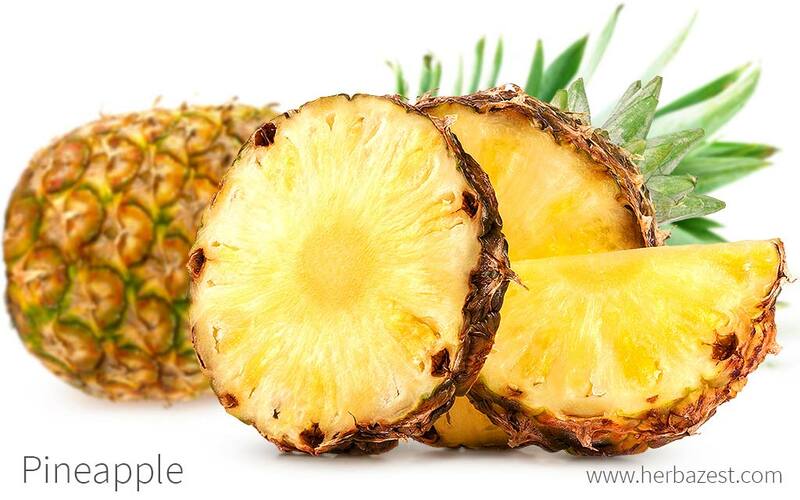 Thanks to its anti-inflammatory properties, pineapple can help improve the symptoms of osteoarthritis. Additionally, pineapple has been traditionally used for treating hay fever and speeding up the healing of sunburned skin. Citric and malic acids are present in the pineapple fruit, as well as vitamin C (ascorbic acid), and its low saturated fat and cholesterol levels add to its nutritional value. Compared to other fruits, such as apples and bananas, the pineapple also has a low calorie content, although the proportion of calories derived from sugar in pineapples is high. The fruit also contains plenty of antioxidants. Most of the medicinal uses of pineapples stem from bromelain, a set of proteolytic enzymes that can be found in pineapple juice or extracted from the plant. Bromelain is credited with easing digestive problems, as the enzyme helps break down hard-to-digest proteins in the digestive tract, which prevents any of the gastrointestinal symptoms associated with poor digestion. Bromelain is additionally useful thanks to its anti-inflammatory properties, both on the nasal passages and directly on joints and muscles. It is often mixed with trypsin (a protein) and rutin (a compound found in buckwheat), a combination that has been shown to improve knee function and ease the pain of arthritis. Digestive properties are also present in kiwi and papaya, whereas ginger and turmeric can provide similar anti-inflammatory benefits. Pineapple is generally considered safe in dietary amounts; however, its main compound, bromelain, can cause diarrhea and digestive upset if ingested in excess. In sensitive individuals, pineapple is also capable of causing allergic reactions, including rashes, itching, stomach pain, diarrhea, and vomiting. This reactions are also much more likely to affect those who already have allergies. While the pineapple core is also an edible part of the fruit, it is harder and fibrous, and over-consumption can result in the formation of fiber balls in the digestive tract. More research is needed to further understand the effects of bromelain, so it is advisable for those who are pregnant, breastfeeding, or have recently had surgery to avoid taking any supplements containing this enzyme. It should also be noticed that unripe pineapple is toxic and should not be consumed. As well as the fruit's culinary uses, the group of proteolytic enzymes that can be extracted from the stem of a pineapple or found in its juice has various medicinal benefits. Pineapple features as an ingredient in many culinary preparations across the world, particularly in African and Caribbean cuisines. Raw. The sweet citrus flavor of the pineapple fruit have made it popularly consumed in its raw form, sliced or in salads, as well as grilled or cooked. In this form pinneapple provides all its digestive enzymes and dietary fiber, which aid digestion and help relieve constipation. Juice. While insoluble dietary fiber is discarded in pineapple juice, the anti-inflammatory properties of pineapple, as well as its digestive enzymes, can help relieve inflammatory pain. Capsules. This supplemental form of pineapple provides high concentrations of bromelain, the medicinal enzyme in the pulp of the fruit, and can be taken every day, in standardized doses, as a digestive and anti-inflammatory aid. Fresh pineapple and pineapple juice are all available year round in major supermarkets and organic food stores. In warmer regions, fresh pineapples of different varieties can be purchased at farmers' markets and from local producers. Canned pineapple contains very little vitamin C and high amounts of sugar. It is recommended to consume the fruit in its fresh, raw form. Bromelain supplements can be found in specialized health stores, and are readily available for purchase through online retailers, which usually stock a wide variety of brands and concentrations. It is important to look at the full product information and choose a certified manufacturer to ensure the supplement's efficacy. The two most widespread varieties of pineapples are not grown from seed, as they are incapable of fertilizing their own eggs. Cultivated in countries with tropical climates, such as Thailand or the Philippines, pineapple requires specific conditions in order to thrive and give fruit. A high amount of aluminum is characteristic in the areas where pineapple plants are cultivated. Since very few other crops can resist such conditions, pineapples are useful for providing value to otherwise fallow land. Pineapple plants are cultivated from a crown cutting of the fruit (the vegetative shoot on top of the plant) or slips and suckers (shoots that develop from the main stem), which are then planted directly in the soil, and will flower in 22 - 24 months. The ideal soil for pineapple should be highly acidic, mineral rich, moist but well-drained. The plant requires low humidity, full sunlight, and temperatures between 32 - 90°F (0 - 32°C). The plant yields two harvests per year. The pineapple plant grows close to the soil surface to a height of up to four feet (122 cm), though approximately three feet (90 cm) of this is formed by its stiff, waxy, and often sharp leaves. A pineapple's fruit is composed of berries, which grow and fuse to the central stalk. About 15% of the fruit is sugar, which accounts for the sweet and juicy flavor that popularized pineapples for consumers worldwide. The pineapple, or Ananas comosus, is a member of the Bromeliaceae family, which comprises approximately 3,210 species of flowering plants native to tropical America. However, unlike most of its relatives, the pineapple grows in land), while most bromeliads are either saxicolous, growing on rocks; or epiphytic, growing on other plants and trees. Pineapple is also the only member of its family to produce edible fruit. Because of its popularity, many different varieties and cultivars of pineapple have been identified. The three main varieties are A. comosus var. sativus, A. comosus var. comosus, and A. comosus var. lucidus. Unlike the comosus variety, the sativus variety does not produce seed and is not able to germinate, so it can only be propagated through cuttings. Meanwhile, the lucidus variety is the most common choice for agroindustrialists, thanks to its lack if spines, which make it easier to harvest. There are four key cultivars of the pineapple plant: 'Smooth Cayenne', 'Red Spanish', 'Abacaxi', and 'Queen'. 'Smooth Cayenne' (which includes variants such as 'Hilo', 'St. Michaels', and 'Giant Kew') boasts a sugary, low-fiber flesh that makes it ideal for canning, and constitutes 90% of the world's canned pineapple. In contrast, 'Red Spanish' pineapples (grown in the West Indies, Mexico, and Venezuela) are higher in fiber, and their tough skin means they are able to withstand international shipping. Types of 'Red Spanish' include 'Cabezona' and 'Valeran'. On the other hand, 'Abacaxi' is the tenderest of the main cultivars (including variants such as 'Black Jamaica'); its rich, juicy flesh means that it is considered to be extremely tasty, although the tenderness means it does not ship as well as the other cultivars. Finally, 'Queen' pineapples are more compact than the other types: small-cored and fragrant, they are best enjoyed when eaten fresh, and do not serve well when canned. Examples of 'Queen' pineapples include 'MacGregor' and South Africa's 'Natal Queen'. Though originating in Southern Brazil, the first recorded discovery of pineapples was in the Caribbean by Christopher Columbus in 1493. Because of this, the fruit has been historically linked with the idea of exploration and wealth: in the 17th and 18th centuries, it became habitual for sailors to place a pineapple outside their home to signify their safe return from a long voyage. During the 17th century, the pineapple was also used as a status symbol for socially elite Europeans, who used the fruit to adorn their banquet tables as a means of expressing their affluence. As the pineapple trade increased over the centuries, this tradition developed beyond seafaring communities to symbolize a general message of welcome and friendliness. With their potential to be consumed fresh, juiced, as a preserve, and canned, pineapple's main economic use is culinary. Pineapples contribute to over 20% of the world's production of tropical fruits, and are the only member of the Bromeliaceae family that produces edible fruit that can be used for consumer purposes. Pineapple crops also provide some countries with a major source of export: in 2010, Brazil exported 2,120,030 metric tonnes (2,336,933 short tons) of pineapples, followed by the Philippines, with 2,169,230 mt (2,391,166 st), and Thailand, with 1,924,660 mt (2,121,574 st). Fiber. In the Philippines, pineapple leaves are used to create a textile called fiber-pina, which is used as a material for making wallpaper and furnishings. Industry. Isolated and processed, bromelain extracted from pineapples is sold commercially as a meat tenderizer and to chill-proof beer.